To return to the team summary page, click My Team View above the employee's profile image. Note: Your interface and options vary based on whether you are using Classic Mode or Lightning Mode. My Team View Click to go back to the My Team View page. The most recent filter selection in the employee summary page carries over to the team summary page. Employee Information View-only. The employee photo, name, and phone number are located in the upper-left area of the page. The information shown is pulled from the employee’s profile in Salesforce. Click to change the selected date range. Click to refresh the data shown. Click to view the Sales Category chart, which is otherwise obscured when viewing the Conversation Timeline. Want to get a better view of the strengths and weaknesses of all teams and sub-teams available to you? If you are authorized, the Periscope feature allows you to view the team analytics of another user as if you were that user. Click to view a hierarchical list of managers, teams, and sub-teams available for Periscope view; if you select a team leader or manager for example, you also select all their displayed subordinates for viewing. The filter options are located above the Sales Category chart. The filter contains whatever was previously selected. For details on using the filter options, refer to Filter Your Data. The Employee View page gives you access to information on an employee's call activity, sales, and more. 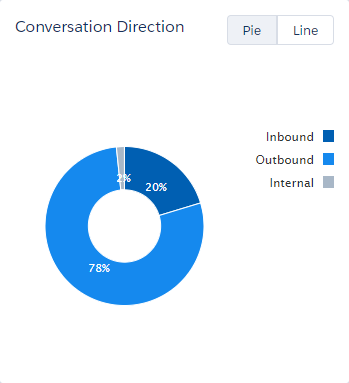 The Conversation Direction chart summarizes total call employee activity by inbound and outbound calls with external numbers, and a total of internal calls (contains both inbound and outbound calls with peers). To toggle between the pie chart and bar chart views, click the relevant icons by the chart title. The Call Activity table summarizes the employee’s call activity during the query period. Grand Total Calls The total of all calls to leads, customers (contacts or accounts), peers (internal), and non-customers (everyone else). Customer Focus The percentage of calls to leads, contacts, or accounts listed in the Salesforce CRM, divided by total calls. If an employee made 100 calls, and 75 were to Salesforce leads, contacts, or accounts, while 20 were to peers, and 5 were to non-customers, then the Customer Focus would be 75%. Customer Calls The total number of calls to leads, contacts, or accounts. Not Found in Salesforce Calls The total number of calls to people or businesses whose phone number cannot be found in Salesforce. A call to a customer that is not listed in Salesforce is also counted here. 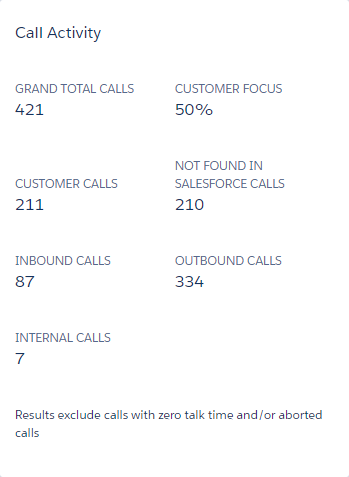 Inbound Calls Total inbound calls from everyone (leads, contacts, accounts, and numbers not found in Salesforce) except internal numbers. Outbound Calls Total outbound calls from everyone except internal numbers. Internal Calls Total inbound or outbound calls with peers. The Productivity table measures the productivity of an employee using three metrics. My Revenue The total amount of revenue from all active opportunities where the sales pipeline stage is Closed/Won during the period of the query. Closed Deals The total number of closed deals during the period of the query. It is defined as an opportunity with a pipeline stage of Closed/Won, and the opportunity was closed during the period of the query. Leads Converted The total number of leads that were converted and created as an opportunity within the time period of the query. The Sales Category chart classifies all call activity based on the sales context of a conversation. Typical conversations either involve leads, contacts, or accounts in Salesforce, or are internal calls with peers. If the analytic can find no match for the phone number, then the conversation is labeled as Not Found in Salesforce. You can download the chart as a CSV file by clicking . The first column of each row shows the total value of the row. The entire chart can be filtered. For example, you can choose to show only outbound calls lasting longer than 90 seconds made to leads. Amount The amount of money associated with each column. Total People or Businesses The total number of people or businesses associated with each column. Total Calls The total number of calls associated with each column. Total Talk Time The total time spent on the phone associated with each column. Leads The number associated with a lead in Salesforce, which requires this definition to be turned on within the Salesforce app. Contacts & Accounts The number associated with an existing person (contact) or an entity/organization/company (account). Note: Typically, as conversations mature, customers give their direct lines. 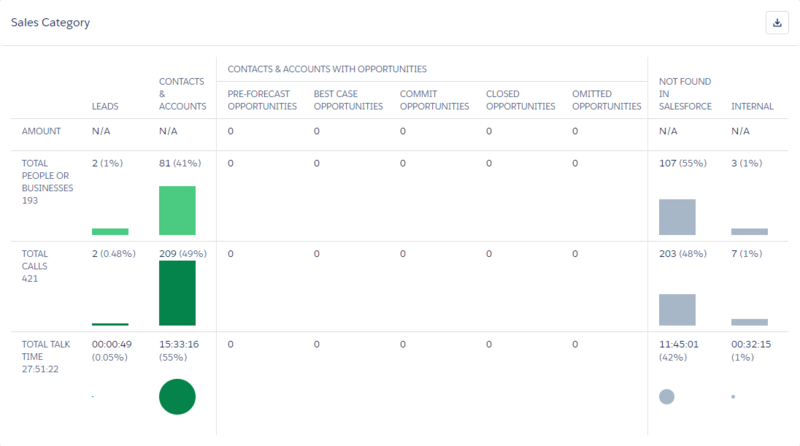 Contacts & Accounts with Opportunities Pre-Forecast Opportunities The number associated with a contact or account that also shows opportunity activity during the period of time of the query. For example, a query looks at all calls from March 1 to March 28; it finds a match between a sales representative and a contact, who belongs to Acme Corp, which had an opportunity that was changed (such as a change of pipeline stage or revenue). The analytic assumes the conversation involves the opportunity. If no opportunity activity exists, then this conversation would be classified under the Contacts and Accounts category. If a salesperson wants to ensure that the call is tied to the opportunity, then they should change an opportunity field to ensure that the opportunity data is reflected in the chart. Best Case Opportunities Calls associated with an opportunity under the Best Case category in the sales forecast. Commit Opportunities Calls associated with an opportunity under the Commit category in the sales forecast. Closed Opportunities Calls associated with an opportunity under the Closed category in the sales forecast, and/or under the Closed/Won category in the pre-forecast pipeline. Omitted Opportunities Calls associated with an opportunity under the Omitted category in Salesforce. Not Found in Salesforce Calls that are not associated with leads, contacts and accounts, pre-forecast pipeline, etc. Note: It is possible for actual customer phone numbers to fall into this category if their phone number has not been entered into the Salesforce CRM. To prevent this, keep your contacts up to date. Internal Calls with fellow employees. This category shows how much talk time is spent on internal calls, versus talking to customers directly. 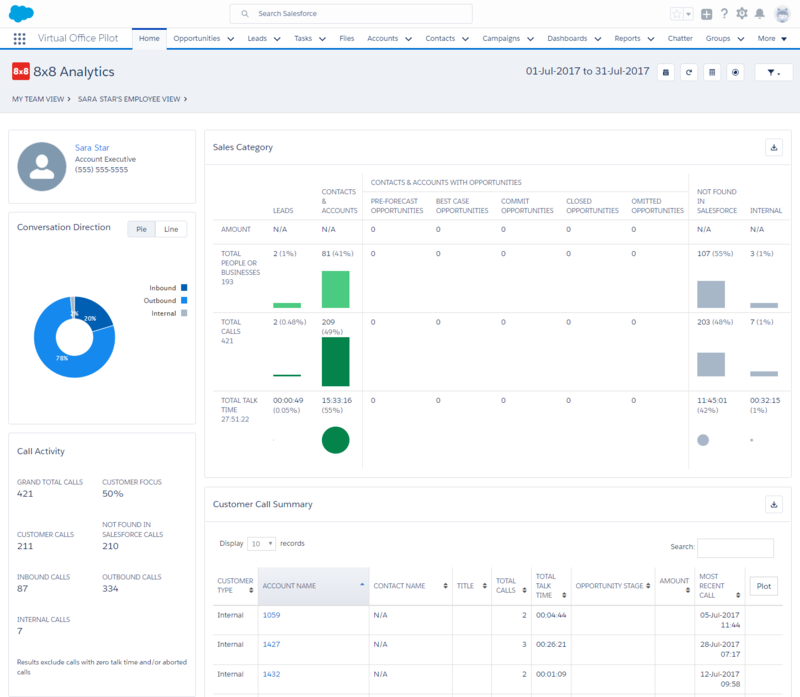 The Customer Call Summary table summarizes calls made by the employee, and launches the Conversation Timeline via Plot. Note that the timeline appears in place of the Sales Category chart further up on the page. You can download the chart as a CSV file by clicking . Display records Choose from the drop-down to show 10, 25, 50, or 100 customer rows in the table. The default is 10 rows. Search Type to search for specific names, titles, or other words found within the table, such as <VP of Sales>, <ABC Company>, <Closed/Won>, etc. Sort Click the title of any column to sort the table in ascending or descending order. Click at the top of the page to apply filters to the whole table. Account Name Refers to the name of the parent account in Salesforce, and functions as a hyperlink to the account profile. Contact Name Refers to the name of the person associated with the phone number, and functions as a hyperlink to the contact profile. The contact name is written in red italics to indicate if multiple phone numbers exist. Click the text to view more details, with links to the original contacts in Salesforce. Title Refers to the title of the contact in Salesforce. Total Calls Refers to the total of inbound and outbound calls to the contact or account for the selected time period. Total Talk Time Refers to the total time spent on the phone for the selected time period. Opportunity Stage Refers to the pipeline stage of the opportunity at the time of the query, which gets tracked only if there is a change to the opportunity. The stage is written in red italics to indicate if multiple opportunities exist. Click the text to view more details, with links to the original opportunities in Salesforce. Amount Refers to the amount of money associated with an opportunity. Most Recent Call Refers to the date and time of the most recent call made to the contact. Plot Visualizes the call activity associated with a customer. Multiple customers can be selected to allow easy comparison. Click the open cell of the desired customer or customers in the column, and then click Plot in the header to open the Conversation Timeline. Note that the timeline appears in place of the Sales Category chart further up on the page. The Conversation Timeline allows users to view and compare customer call activity. To select the type of calls desired to be seen in the timeline, click . 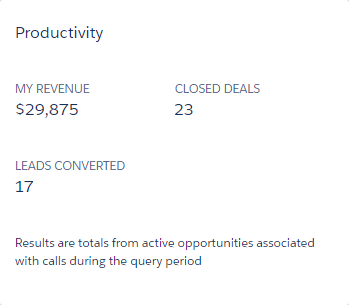 For example, if a user wants to see outbound calls to leads that lasted longer than 90 seconds, then the filter selects these conversations for the Customer Call Summary table, which can then be plotted on the timeline. Each bubble represents one call. The size of the bubble indicates the length of the conversation relative to other conversations that are shown. Note: This means that the bubble size changes based on the longest and shortest call duration in the chart. The color of the bubble indicates the sales category during which the conversation occurred, such as pre-forecast pipeline, best case, etc. Hover over a bubble to get more information, such as who was contacted, opportunity information, the exact call length, etc. Find a customer, or use the filter options in at the top of the page to select a set of customers for the Customer Call Summary table. In the Customer Call Summary, click the empty cell in the Plot column for the desired row, which then shows , indicating the selection. Click Plot in the column header. The Conversation Timeline appears in place of the Sales Category chart. Multiple conversations can be selected for comparison; just select multiple customer rows in the Customer Call Summary table. To remove a conversation from the chart, click in the relevant row to deselect the conversation from the table, and then click Plot in the column header to refresh the chart. To reopen the Sales Category chart, click in the upper-right corner of the page.